Wow! This Venus woman sure likes beautiful things! Not for her some pot made out of brown clay - her flowers are kept in a beautiful, glass, latticework affair. They're also kept in cold, dark seawater so the flowers are probably dead, but the vase is looking great! 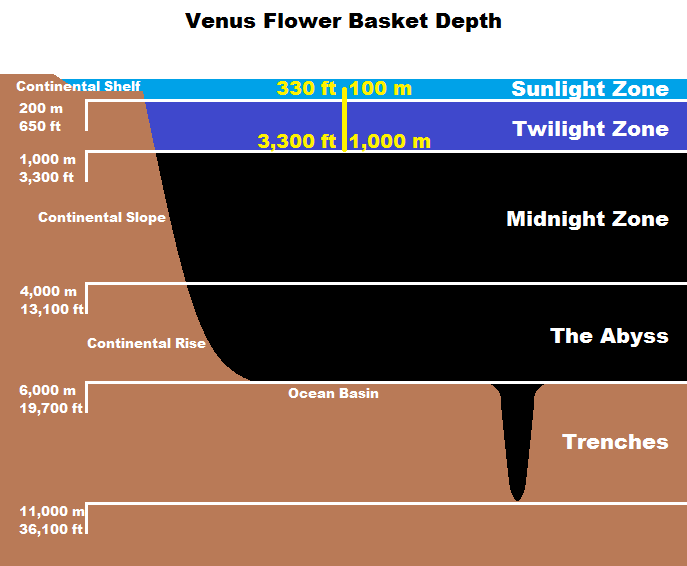 The Venus' Flower Basket is a Sponge found at depths of around 100 to 1,000 metres (330 to 3,300 feet) on the ocean floor near Japan and the Philippines. 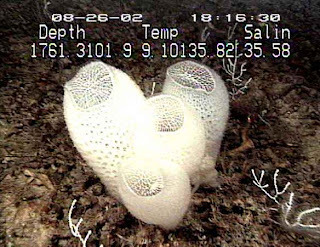 It's a kind of Glass Sponge, which means they have a skeleton made up of spicules - tiny, spiky structures made of silica, also known as silicon dioxide. This stuff is usually found as a sand or quartz and is used in glass, ceramics, our own food and all sorts of other applications. 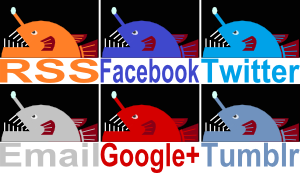 Clearly, this is very useful stuff! The Flower Basket uses it as supportive scaffolding as it grows to some 25 cm (10 inches) in height. We usually only see this skeleton, bleached, dried and ornamental. In their natural environment there is a thin layer of living cells surrounding it. Water is drawn in and plankton filtered out to eat. But Venus is the goddess of love, as well as beauty. In Japan her Flower Basket is traditionally given as a wedding gift, and it's not just because it's a breathtakingly exquisite jail cell from which no man, woman or child can hope to escape unscathed (don't let that put you off, though). It's also because of a couple of shrimp. Obviously. These shrimp live in the Basket until they grow too big to get out. It's one male and one female, monogamous, trapped in crystallized wedlock that is now their home forever. No suspicious overtime at the office, no begrudged lady's nights out, just constant and continual companionship until death (or murder, I would think) do them part. At least they won't be arguing about the cooking since they can eat whatever bits and bobs flow through the sponge. Chores like cleaning might be more problematic as they like to keep their home clean and sparkly, which is something the sponge no doubt appreciates, too. The shrimps will eventually mate and the youngsters will leave while they're small enough to do so. Out into the darkness they go, in search of the shining lights that promise their own marital bliss. I haven't mentioned the shininess, have I? 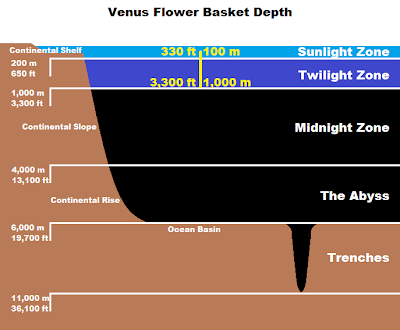 You see, Venus' Flower Basket is also home to bioluminescent bacteria, meaning it glows brightly in the gloom. As lovely as the skeleton is, it pales (literally!) in comparison to the living animal. Sort of like the Pyramids of Giza now that their bright, reflective covering is lost. Wow! 2? I don't think I have even one of those. 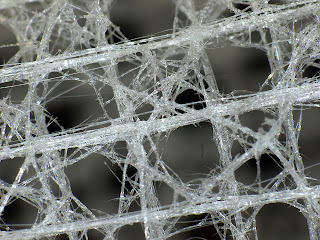 Venus' Flower Baskets also have fibres at the lower end that keep them attached to the sea floor. Their diameter is about the same as a human hair and they act rather like optical fibres, transmitting light from one end to the other. The thing is, they not only do this better than our own human efforts, they are also far more flexible and are formed in the cold of the deep sea. 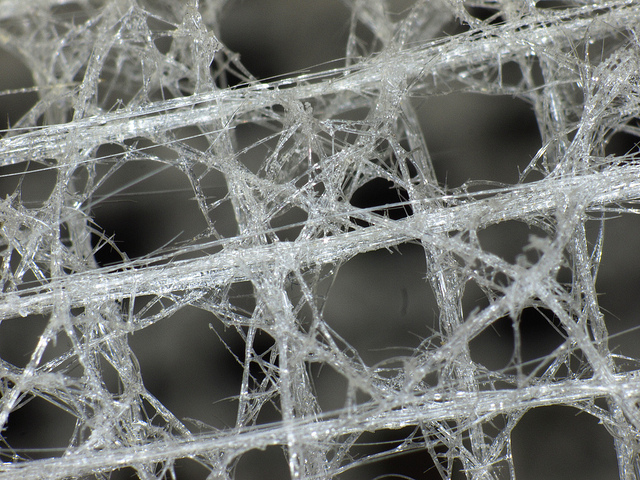 Ours require high temperatures and create something brittle that can be broken easily. Fibre-optics are used in telephones, cable television and the internet, so the Venus' Flower Basket is actually a modern, well-lit skyscraper with regular food deliveries, all the latest entertainment and communication technologies and scenic views of acres of surrounding mud. That's some sweet prison for our shrimpy lovebirds. I wonder if they're reading this? I think brutal murder is always an option, but I get your point! Wonder how the Basket feels about shrimp making more shrimp inside it. Seems kind of... sticky. Haha! That's such a pleasant adjective, I'll have to try it out next time I'm talking to people about... stuff. Think brutal murder is always an option, but I get your point! What a dellighful reaction :D That's such a pleasant adjective.. I have a specimen of one these magnificent sponges, "euplectella Aspergillum", in my small curiosity collection, it attracts many appreciative comments. Nice! It's as interesting as it is beautiful! Amazing Venus' Flower Basket i really like it Send gifts to Pakistan online.